Gucci taps the illustrator for a new tee collab. 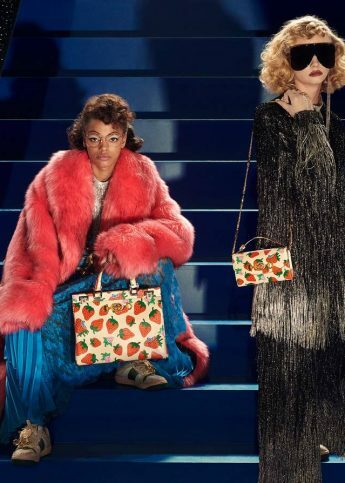 Following collaborations with photographers Petra Collins and Coco Captian, fashion powerhouse Gucci has now teamed up with super satirical illustrator, Angelica Hicks. With an Insta bursting with tongue-in-cheek pop culture references including LOL depictions of Kim K and Anna Wintour as you’ve never seen them before – not to mention Gucci going experimental with recent ad campaigns featuring meme’s and aliens – Hicks is perhaps the perfect collaborator for the Italian brand in 2017. The collaboration manifests in a collection of limited edition tees with a plethora of diverse illustrations, featuring the likes of ethereal Florence & The Machine front-woman Florence Welch; others see Gucci-fied depictions of freaks and geeks, while each comes in a limited edition metal box (seriously! ), also featuring Hicks’ illustrations. To celebrate the release of the collection, Hicks took to the streets of Milan and New York (obvs) to create two marvellous murals. Appearing at Lafayette Street in NYC’s super-cool Soho neighbourhood and Milan’s Largo la Foppa, in the popular Corso Garibaldi area; there’ll even be a special Snapchat geo-tag for when you’re in those areas to make sure your socials are looking double cute. We know exactly what we’ll be wearing this summer. And where we’ll be heading.